FREE SHIPPING on $ 99 purchase. (*) 5 % INSTANT SAVINGS on $ 50 purchase. This 6 piece kit pulverizes stains on tile, tubs, and showers with out the use of harsh chemicals and odors! Kaboom Ultra Scrub is a thick cream formula that clings to and penetrates grime to remove stubborn stains. You will love the power and effectiveness. Easy to use, with a no-mess cap, Kaboom Ultra Scrub tackles the toughest jobs. Use it to remove hard water build-up, soap scum, dirt, grease, lime and rust stains. 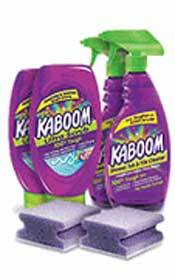 Kaboom Shower, Tub & Tile Cleaner tackles tough stains needing effective, specialized cleaning care. Use it on porcelain, ceramic, stainless steel, fiberglass, acrylic plastics, concrete, copper, and brass. FAUCET & FIXTURE WAX 3.4oz. LIQUID GRANITE ACRYLIC & MARBLE POLISH 8.5oz. LLorente Bakeware Set 3 Pcs. LLorente Bakeware Set 4 Pcs. Miracle Foot Repair 8 Oz. Orange Glo Hardwood Floor Cleaner 32oz. Orange Glo Polish 32 Oz. Oxi Clean Dishwash 48 Oz. OxiClean Miracle Foam Sprays 2 Pcs. Oxiclean Outdoor Stain Remover 3.5 lb. Oxiclean Versatile Stain Remover 6 lb. Pocket Key Case Unit - .54oz. RIFLE & GUN WAX 3.4oz. Sabre Hard Case Unit - .54oz. Sabre Jogger Model - .79oz. STAINLESS STEEL CLEANER WITH DEGREASER 16oz. Our as seen on tv infomercial products appeal to customers of every age and income level. This as seen on tv store has a variety of infomercial products at some of the lowest prices possible to choose from. Cyberbrands.com. Inc. uses secure sockets layer which encrypts sensitive information before it is sent over the internet.